Aerie Knobs are a drone accessory that every commercial remote pilot needs. These knobs have significantly made endurance flying much easier for me. The knobs help with smoother flying which leads to a higher quality video. Besides, these knobs could be considered a fail-safe if your fingertips happen to slip from the joystick center point. So far, I’ve been about to fly with these knobs for almost 55 hours. While flying for long periods of time, my fingers sometimes become a little sweaty. During the Maryland summers and standing outside in the heat while completing hours of flights can take a toll. For me, the tax is more mental than physical because flying UAVs can be stressful at times. Aerie Knobs have changed that, my fingers do not become fatigued anymore either. With the stock remote control knobs, I had to apply pressure to keep my fingertips on the knobs. Now, I place my thumbs inside the Aerie Knobs which significantly improves flight experience. I am also suggesting these knobs for EVERY drone user as well. As mentioned before, the knob walls act like a failsafe while flying. 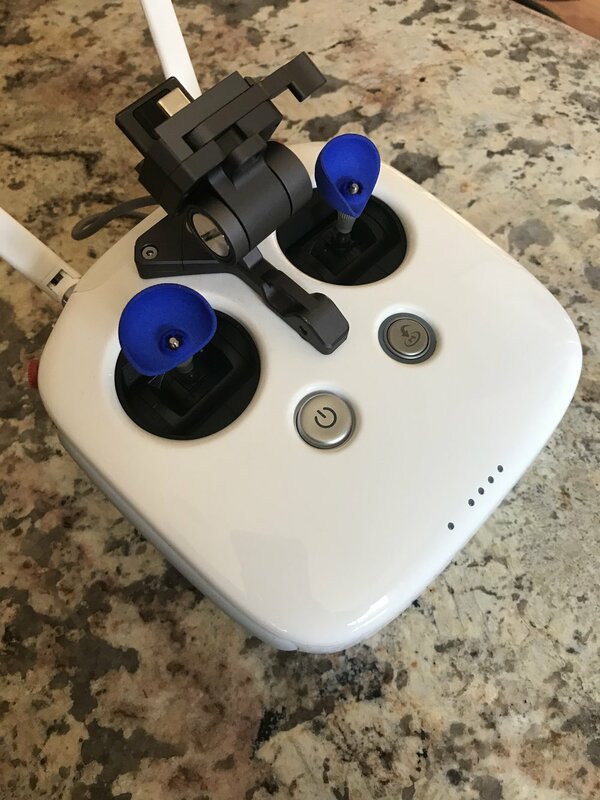 Since the DJI Phantom 4 Pro’s RC sticks are spring loaded, they will recover to the center point if we let go of them sending the drone into a hover. If the sticks set back to center by accident, you'll have to retake that shot. However, the designer has implemented a wall that helps with this problem. Those that have flown with my RC testing the knobs, all noticed a different flying experience quickly. Of course, each of them needed to become familiar with the new feeling before really pushing the sticks hard. Aerie Knobs are not available yet for the DJI Mavic Pro and Spark line, but the founders did say they are coming shortly. Many commercial operators use DJI’s CrystalSky, I believe. The knobs were not designed to be used with the monitor so I cannot say anything negative because of this. However, it is easy to work around the minimal issues with the knobs. Since the CS mount for the controller is wider than the stock or P4P+ RC, the knob’s walls touch the mount. Thus, decreasing the range in a movement of the remote controller’s sticks. There is still plenty of room to move the sticks though; I just needed some time with them to adjust my thumb movements. The upper portion of the wall slightly toucher the CS RC mount. If you are not using DJI’s CrystalSky, then these knobs are 10/10. Those of us that use the CS, I recommend these with a 9.5/10 rating. However, I have been informed that Aerie Knobs is now developing a knob specifically for CS users. Once the CS knobs are out, I have a feeling my rating will soon be a 10/10!